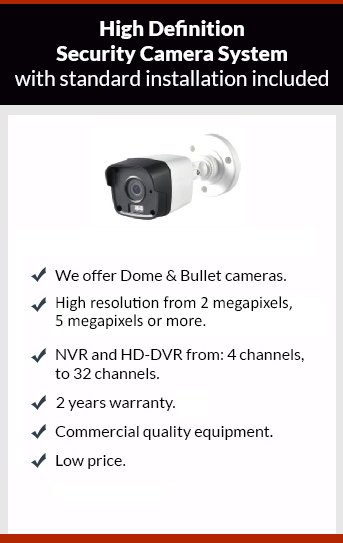 Get affordable Security Camera Installation on East Los Angeles, CA and CCTV equipment with commercial quality and 2 years warranty. The future of the security camera system is IP technology. IP camera is digital camera that transmits data over LAN (local area Network) or WAN (wide area network). IP cameras or network cameras are most often used as CCTV security camera. Benefits of IP camera over analog technology include: Control on the camera through the same wire connection (Cat5e or Cat6) with remote administration. Remote administration controls includes Zoom, Pan and Tilt. Since the IP camera is connected to internet is easy to send images and video anywhere. It offers much more sophisticated capabilities; IP surveillance is rapidly replacing analog CCTV. An IP camera also has some disadvantages: increasing level of complexity, increasing level of price, requires fast switches and routers. When we want a centralized unit for video recording we use a NVR (network video recorder) this unit performs the same function as a DVR. It records each camera’s signal, and compresses in H264 format. The main difference between IP security camera and analog security camera is that the IP video is higher resolution than analog. Software built into the NVR provides a DHCP (Dynamic Host Configuration Protocol) that functions like router to assign to each IP security camera an IP address. Call Protection4Less today we have the best IP technology at the best price.